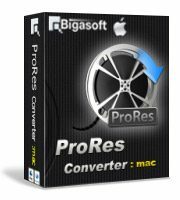 Bigasoft ProRes Converter for Mac is designed for Mac users to encode or decode all types of Apple ProRes codecs including ProRes 4444, ProRes 422 (HQ), ProRes 422, ProRes 422 (LT), and ProRes 422 (Proxy). This powerful converter helps to solve all issues in importing video to Final Cut Pro, iMovie or Final Cut Pro X by converting any video to ProRes. And it can make your ProRes videos compatible with any player or media devices (iOS, Android and Windows OS). What’s more, Bigasoft ProRes Converter for Mac is also best Apple Compressor alternative with fast encoding speed and broad video formats supported for exporting projects from Final Cut Pro and Final Cut Pro X. Besides batch converting between various video/audio formats, with the built-in video editor of Bigasoft ProRes Converter for Mac, you are able to cut, trim, crop, merge, clip your movies, add or remove audio, subtitle, watermark to meet all your different needs.